Simple, rustic and comfy cozy. 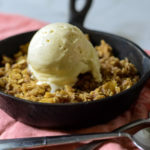 Warm peach crisp on a cold winter evening is divine! Let me know what you think. Butter the bottom of a small (4 inches in diameter) cast iron pan. In a small bowl, combine the flour, sugar and spices. Using a fork, work the remaining butter into the flour mixture, until it forms a crumble. Line the bottom with a layer of peaches. Bake for 15-20 minutes or until brown and crispy. I made this recipe using a cute little cast iron pan that I found at a garage sale. If you don’t happen to have one, any small dish that you can bake would work.